Dozens of locals blocking entrance to village near scene of the attack. Other protests at Shilo, Neve Tzuf junctions and near Yitzhar. 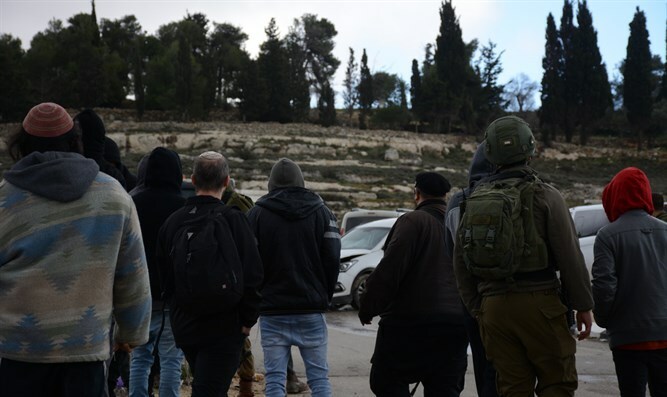 Dozens of Jewish residents are blocking the entrance to the Arab village of Beitin, near the site of the attack that occurred Thursday morning at the Givat Assaf junction. Simultaneously, additional demonstrations are being held in protest of the attack at the Shilo junction, at the Neve Tzuf junction, and near the community of Yitzhar. At the same time, MK Bezalel Smotrich (Jewish Home) issued a call to the residents of Judea and Samaria to go out this evening independently and to close the roads to the movement of Arabs. "I call upon my friends, the heroic and pioneering settlers, to leave tonight and close Route 60 along its entire length to Arab vehicles. If there are terror attacks, there are no Arabs on the road," Smotrich wrote on Twitter.